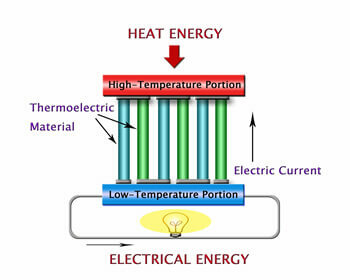 Converting Heat to Electricity | Thermtest Inc.
Thermoelectric power generation has the potential to solve one of the major concerns of our current energy use, the fact that over 50% of what we consume is actually lost as waste heat. Semiconductors are able to capture this wasted heat, and convert it to useable electricity by maintaining a heat flow across a temperature gradient. In order to achieve this they must have a high electrical conductivity combined with a low thermal conductivity. This ensures they can produce satisfactory amounts of electricity while maintaining the temperature gradient necessary for its generation. Inorganic materials have long been used as semiconductors, however a new paper published last week by scientists at the National Renewable Energy Laboratory (NREL) has shown that carbon nanotubes have incredible potential for use in the thermoelectric field. The research team created thin films of single walled carbon nanotubes, which then underwent a doping process to increase the electrical potential of the material. Researchers were able to determine the exact doping amount that produced the best thermoelectric results. Metallic nanotubes, which would react adversely with a thermoelectric generator, were carefully separated from the semiconducting nanotubes. Carbon nanotubes have a distinct advantage over traditional semiconductors as they are much lighter and more flexible. Additionally, the researchers discovered the carbon nanotube film was able to maintain a high thermopower alongside a high electrical conductivity, an impressive improvement over traditional semi conductors, which lose thermopower as the electrical conductivity rises. Furthermore, the doping process applied during the manufacturing process lowered the thermal conductivity of the final product, giving it another important characteristic required for strong thermoelectric performance. Experiments revealed that the film had equivalent performance to that of highly conductive polymers. This research is an exciting step forward in the quest to capture the energy that is lost as waste heat. As the first study to perform in depth research on the thermoelectric potential of carbon nanotubes, these exciting results may lead to a new application for these versatile structures. To learn more about the study and the results please follow the links below. An example of how the Hot Disk TPS can be used to analyze the thermal properties of carbon nanotubes can be found here.